In this first of a series of collection ‘spotlights’, focusing on a single book or other item in our collections each month, I’d like to start at the beginning – in almost every sense. This month’s book, First Steps in Assyrian by L.W. King (1898), is one of the first you can see on entering the Theology Room, the first of our two historic reading rooms. The language that the book examines, Assyrian, is one of the first sign-based language systems to have developed in human civilisation. It is also a language that, coincidentally, begins with the same letter assigned to it in our unique classification system. The classification system our library uses, designed by Gladstone himself, begins as the alphabet does with ‘A’. This section, called ‘Prolegomena to the History of the Bible’, contains everything from the archaeology of the New Testament, early Christian-Jewish relations, and the history and study of Judaism itself. It also contains books on languages and scripts once written, spoken, and read in North Africa, Asia, and the Middle East, mostly printed in the 19th and 20th Centuries. Some languages, like Arabic, are still spoken by millions today. Others like the Egyptian hieroglyph or, in this case, Assyrian, have become languages understood only by scholars. This is an extraordinary fate for language of an empire that, at its height from the 9th to the 7th centuries BCE, extended out from modern-day Iraq, to contemporary states such as Syria and the Lebanon, all the way to Egypt. 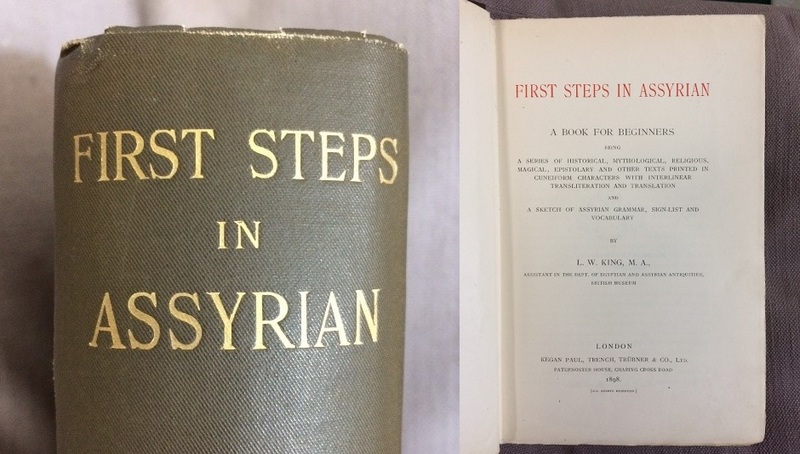 First Steps in Assyrian (1898) was the first book I took off the shelves to read when I began here as a residential intern in May 2013. (librarians do read our books, but only in our own time.) I had recently been awed by Assyrian artefacts in the British Museum, but knew too little of the arrowhead letter-forms cut into clay and stone. As I discovered, cuneiform inscriptions were not fully comprehensible by scholars until the 1840s and 1850s, thanks to the work of figures such as Henry Rawlinson and Edward Hincks. The author of this month’s profiled book, Leonard William, or L.W., King (1869-1919) was Assistant Keeper of Antiquities at the British Museum. Alongside figures such as Rawlinson and Hincks, he was an authority on ancient near-eastern antiquities in the late 19th and early 20th Centuries. These images from the book show the symbols of the syllables in Assyrian cuneiform, as well as some comparative vocabulary between Hebrew and Assyrian. King sets the daunting yet admirable demand that any student of Assyrian should ‘familiarise himself with the forms of the characters until he can write out the list of signs by heart’ (p. xxxiv). Needless to say, I cannot write these signs by heart. However, it is hard to forget the symbol for rainfall. As King explains in the image below, combining two or more ideograms creates a new word. The word for ‘rain’ combines the symbol for water and the symbol for heaven (‘heaven-water’). When it rains in Assyrian, the heavens have truly opened. Most Assyrian cuneiform inscriptions were inscribed into clay tablets which were then fired in ovens. Unlikely as it may seem to modern minds, the translation of a particular seventh century BCE tablet, held and catalogued by the British Museum as K.3375, was one of the most startling revelations made through translation in the 19th Century. The ‘Mr. Smith’ Gladstone referred to was George Smith (1840-1876), whose passion and gift for Assyrian cuneiform led him to translating what became known as the ‘Flood Tablet’. It is still on display at the British Museum. What Smith’s translation revealed was an account in Assyrian of what Gladstone and his contemporaries understood to be the Great Flood as described in the Book of Genesis in the Hebrew Bible or Old Testament. That Gladstone was present at Smith’s paper is one measure of the significance of the discovery. For some, the translation confirmed and corroborated the events of Genesis. For many others, it has become one of many ‘flood narratives’ that have been found to exist in the mythography of many Eastern and Western traditions. Of course, Gladstone also owned, read, and annotated many printed items not only on Assyriology, but also on the archaeology and philology of the ancient near East. We have many of these items on our shelves today. All of these titles can be accessed via GladCAT, our online catalogue of Gladstone’s own books and other printed items that also contains transcriptions of any annotations he made in them as well. Cathcart, Kevin J. 'The Earliest Contributions to the Decipherment of Sumerian and Akkadian', Cuneiform Digital Library Journal 1 (2011), 1-12. Available here. Smith, George. 'The Chaldean Account of the Deluge.' Transactions of the Society of Biblical Archaeology 2 (1873), pp. 213-234. (This contains George Smith’s account of the translation of the ‘Flood Tablet’ – you can find our copy in the Annex in our collection of Journals and Periodicals). There is more information on the ‘Flood Tablet’ held at the British Museum here.